Im making a map, G sized, with the xxl era patch from era, have no clue what those numbers mean... some objects have a 48 limit, would love to remove that, can it be done ? If you place too many items of any kind on a map, the game will automatically crash because it can't handle much more than ~40,000 (don't know the exact figure but it's more than 32,768). With the modifications discussed in the previous posts there should be no problem to place up to 65,535 objects. As to your question, are you talking about map editor or game? For mapeditor it's not too difficult to change. However for game, some limits remain. If you put more than 255 garrisons, game automatically crashes. Or 49 seers, 49 towns each make game crash. You'll need VCMI for this kind of change AFAIK. 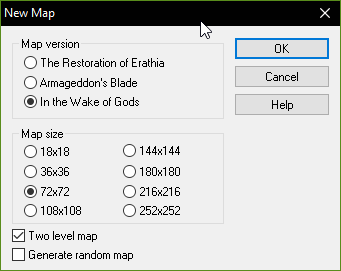 can this "unleashed map editor" be combined with AlexSpl's XXL mod to create the 252x252 maps in your map editor? New map sizes were added a while back. Unfortunately I can no longer edit the opening post of that thread (my requests to do so went unanswered) so here are the posts you'll need. Edited by Maurice at 20:36, 31 Mar 2019. Hey RoseKavalier, I was unaware of the request. I've just promoted the topic to Project, so you should be able to edit it now. Edited by fanofheroes at 02:01, 15 Apr 2019.
is there a way to add graphic mods to the map maker unleashed as we used to add graphics before? For example I wanted to add FredObjects' images to the map maker cause he's created a lot of amazing graphics. To avoid further polluting this thread, I would suggest further questions on Unleashed go in its thread. At some point in the thread, someone discussed how it was possible to link additional object packs, given it is essentially the wog map editor with some extra features you should simply follow the same procedure.